There are four train stations near East Midlands Airport. Which station you connect at depends on where you’re travelling to and from. Regular buses and shuttle services connect each station to the airport. 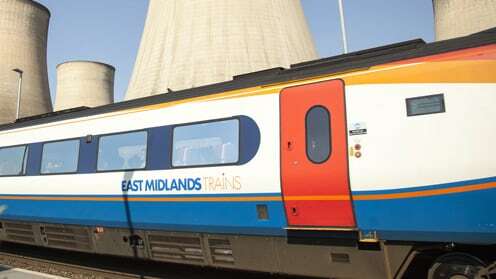 Connect at East Midlands Parkway train station, just 5 miles from the airport, for journeys to and from destinations outside the East Midlands region. The Railink shuttle service connects East Midlands Parkway train station to the airport. There’s no need to pre-book. Simply step off the train at East Midlands Parkway, buy your ticket and board the next scheduled shuttle service. However, if a return journey from the airport is required - outside of the scheduled timetable - you should book this in advance. Derby train station is 12 miles from East Midlands Airport. Connect at Derby train station for journeys to and from Sheffield, Chesterfield and Birmingham, as well as other destinations to the north and west of the UK. The frequent Skylink bus connects the train station to East Midlands Airport. The train station at Nottingham is 12 miles from the airport. Connect at Nottingham train station for journeys to and from Lincoln (and the east of the UK). The frequent Skylink bus connects the train station to East Midlands Airport. Long Eaton railway station is 7 miles from East Midlands Airport. Connect at Long Eaton station for journeys to and from London and destinations to the south of the UK. The frequent Skylink bus connects the station to the airport. Where can I buy a train ticket? You can buy train tickets online or at the station. Booking tickets on the day of departure is easy, but it can also be more expensive than pre-booking your train ticket. Can I buy a train ticket on the day? Yes. You can buy your train tickets online or at the station. Save money by pre-booking your ticket rather than buying it on the day of departure. How do I get from the train station to the terminal?